Hibiscus Sunset » What's Under the Needle? I've made literally hundreds of quilts and every quilt has its own story. 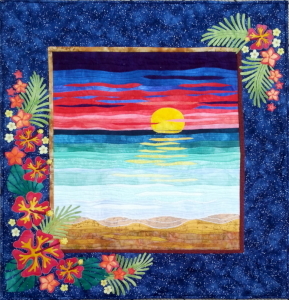 Hibiscus Sunset is one of my newest patterns, its story, however, spans for quite some time. You see, some years ago I was working on a series of landscapes quilts. The first I had originally submitted to a magazine however they felt it had too many applique pieces so I listed as a pattern on my website instead. It became a hit and is still very popular today. 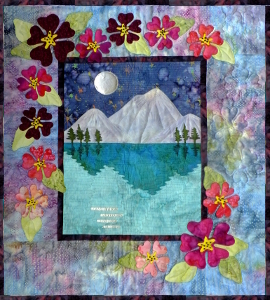 While Moon Lake was in the process of being published I began a second landscape, however, this was put aside because I realized I'd made an error in the border applique - it looked wrong to me so I never published it. The quilt was completely finished so recently I hung it on my wall so I could enjoy its beauty despite the error. Many a person commented on how beautiful it was not realizing the issue that was so obvious to me so last week I took it down and corrected the border. I feel so much better about it now and know it will surely become another hit in my pattern line.